10-15 years ago, the majority of householders had brick built barbeques in their gardens. Not only are they easier to use but quicker to clean without the worry of where to store them. Nowadays it seems building a barbeque for your garden is a thing of the past. 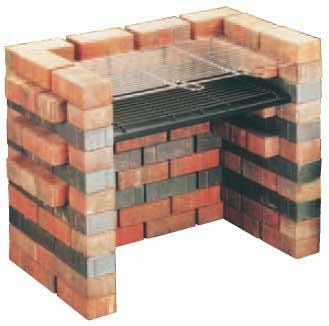 It is a shame because brick built barbeques come in all shapes, sizes and designs. You can purchase plans to build a barbeque but it's not that hard to build a simple one yourself. You just need to be an experienced DIY person and have all the correct tools. First, make sure the area which you plan to build the barbeque is a flat even surface free from bumps and dirt. Try and build the barbeque on a sunny day so it dries thoroughly before use. By building on a wet and rainy day may mean that the cement may not dry thoroughly before using. Building time is usually one day and drying time is a day. If you think the idea of building a barbeque from scratch is not for you, then why not buy one that has already been built. It will cost a few hundred pounds but it will be delivered straight into your garden saving a lot of hassle. It's best to choose this option if you have a direct side access gate making delivery easier, hassle free and mess free. You can also buy a barbeque kit that comes with the bricks, cement, grill and instructions. This is very handy if you are new to DIY or not very confident. It saves you the time trying to calculate the amount of bricks and cement needed and it comes with a plan to guide you step by step.